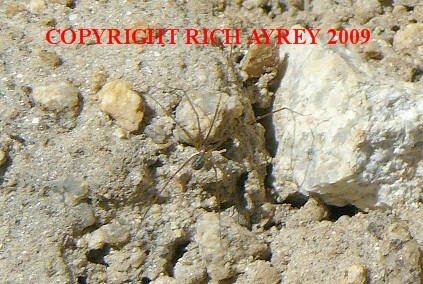 Loxceles species of Brown Recluse spider photographed in Southern Arizona. These spiders are quite common in Arizona. Brown Recluse Spiders are found around human habitation, but at least in Arizona they are more common in natural areas. They are identified by their small body with long spindly legs and by the violin shaped mark on the carapace. This Flagstaff, Arizona site copyright Rich Ayrey 2009. This Arizona Scorpion Page Created 10/17/09.